I am so excited that I found a photo of this woman! 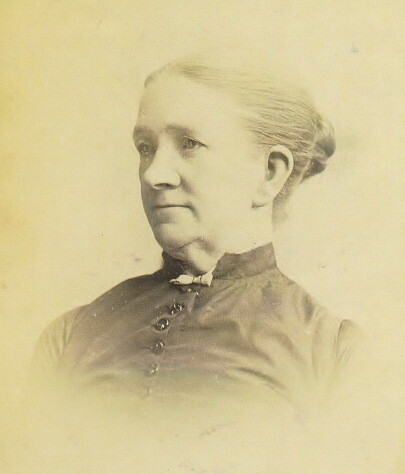 This is Eleanor Allen, who married John Frederick Schrepel in 1865. I am their descendant. She was a Mormon Pioneer and part of the Martin Handcart company that walked 1200 miles from Iowa to Salt Lake City Utah and nearly didn’t survive! Eleanor’s origin is a bit fuzzy, said to be born in Dublin, Ireland, but we are not sure if she is English or Irish-but likely Irish. Her family was in Macclesfield, Cheshire, England in the 1850’s, working in the silk fabric mills. They were likely in Ireland and Eleanor would have been born before the Great Potato Family, so it’s very likely that many children her age did not survive the starvation. Her parents moved to England and found jobs so they did survive. It is thought that Eleanor, her sister and her mother were all widows by 1855. Eleanor was 17 when she signed up with her family to come to America, as a newly baptized Mormon. There was promise of husbands, fertile country to raise a family and plenty of open space. What lay between her and the Promised Land was a very long walk. From Iowa to Salt Lake City. Everyone pushed a handcart (like a wooden wheelbarrow) with their belongings and food in it. Her mother, Mary died on the trail. Eleanor promptly became the second wife (yep, that kind) to prominent polygamist Mormon Elder George Augustus Neal. But political unrest was beginning in Utah, in that the American government did not like the idea of polygamy and intended to break it up. The story goes that as US troops came into the area to do their job, women who were not first wives were forced to give up their husbands, marriages, families, and security. So many became the wives of the soldiers, and it is thought that J.F. Schrepel was one of those soldiers. And there’s even a movie called Sweetwater Rescue!! In the movie Sweetwater Rescue, there’s a quick still photo, of some of the faithful waiting to board a ship to come to America. 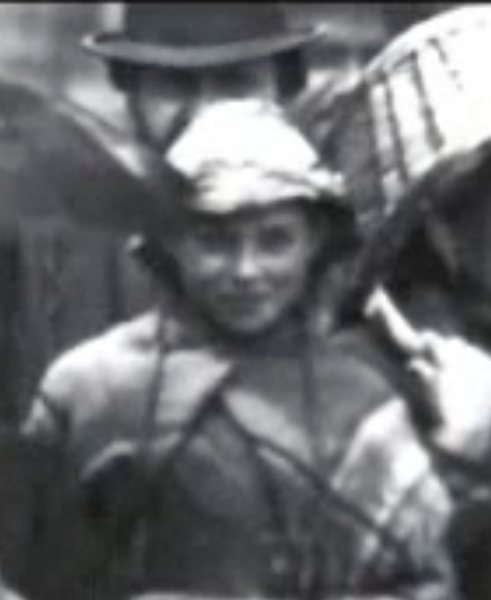 A beautiful young woman stands next to two impish old women-one of whom has a basket on her head. I know it’s a long shot that this is actually Eleanor or her sister, but the young woman looks so like my mother with her pretty cheekbones, I just like to imagine that it IS her! For the record, Eleanor and John F. Schrepel had six children, August, Louisa, Margaret Swan, Charlotte Lizette, Franklin and Frederick. Louisa did not stay with the Mormon faith, but ended up in St. Louis. Louisa Schrepel Downer Nevels and her son Frank in St. Louis. So this is just a little bit of American history, that was buried in my family tree (no one in my family knew about her!) and I wanted to tell her story so it wouldn’t be forgotten! How one young Irish girl could survive famine and an harsh working conditions to make it to America, walk 1200 miles through blizzards and hardship, to find the American dream of a husband and family and a good life. I am SO utterly proud of this woman and I hope that a little of her fortitude and courage has been passed along. She is buried in Salt Lake City Cemetery in Salt Lake City, Utah.